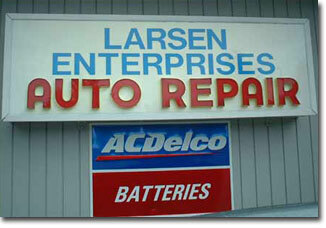 Welcome To Larsen’s Auto Repair! For almost 30 years we have served the communities of Olympia, Lacey, Tumwater, and the greater South Sound. Quality, straight forward, honest, repairs have made thousands of satisfied customers part of the Larsen Auto Repair family. From your personal vehicle service, to commercial and state fleet maintenance and repairs, we look forward to serving all of your vehicle service needs. From your next oil change to major service and repairs, visit us and experience the Larsen Auto Repair difference! Larsen's Auto Repair is committed to offering the best customer service available, the best repairs, and the most options of any repair facility in the tri county area. We strive for the most honest and economical approaches to automotive service and repair available. Overall, we insist at any cost to satisfy both the needs and desires of our customers and we pledge to strive to these ends on a daily basis to the best of our ability.